After sitting in a clay pot for 850 years, ancient squash seeds are bearing fruit. In 2008, archaeologists uncovered a sculpted clay ball used to store seeds at a dig site on the Menominee reservation near Green Bay, Wisconsin. Within this seed ball, seeds from a previously unknown variety of squash were found. Squash-growing pioneers successfully germinated these ancient seeds and produced the first Gete-okosomin squash crop in centuries. The seeds of this squash are now being distributed to indigenous communities throughout North America. Among the oldest domesticated crops in the Americas, squash has been satisfying hungry humans for thousands of years. The wild ancestor of squash predates humans in the Americas and was likely domesticated in southern Mexico. Although consumers may be most familiar with zucchini or butternut, Cucurbita, or squash, is an incredibly diverse genus that includes up to 30 different species. The original domestic variety spread and was adapted through the varied climates and conditions of the Americas. In the following centuries, even places like Japan developed their own local varieties of squash. The squash seeds found in Wisconsin were given to a few individuals and organizations, including Winona LaDuke, Native American activist and Green Party vice-presidential nominee in 1996 and 2000. LaDuke gave the squash its contemporary name: Gete-okosomin, an Anishinaabe word which means “really cool old squash.” White Earth Land Recovery Project, an organization founded by Duke that advocates for Native food and land sovereignty, distributed seeds to other Native organizations and individuals. The squash is a pivotal part of Native agricultural heritage and its revival represents hope to those fighting for their roots and a better future. 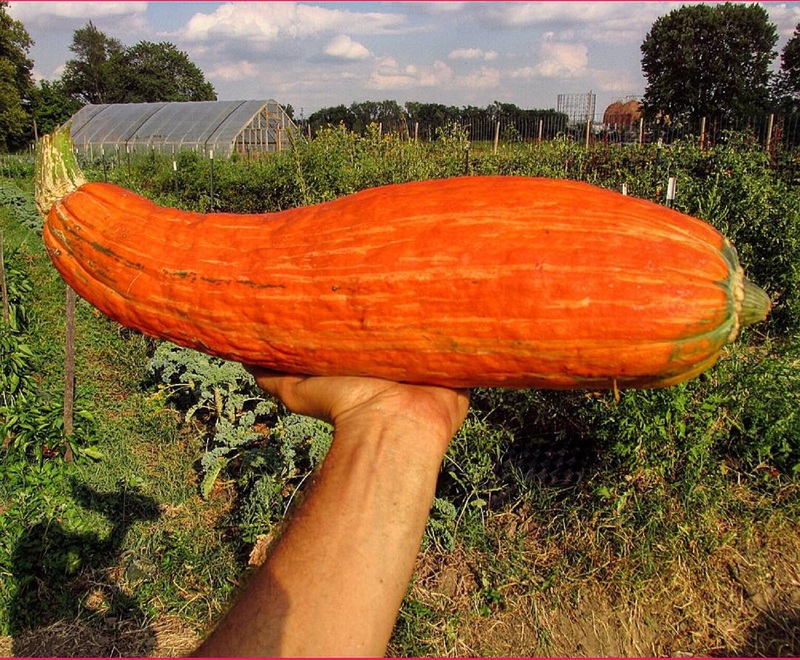 Currently in its fifth generation, the Gete-okosomin squash is not widely available at present. However, similar species of heirloom squash can be grown by even a novice gardener. For example, the green striped cushaw, or Cucurbita mixta, has been grown and cooked in the American Southwest for thousands of years. Adapted to the extreme heat found in this region, the cushaw is hardy against drought and pests, including the squash vine borer. Does ancient squash taste better than modern squash? A close up of the gete-okosomin squash. 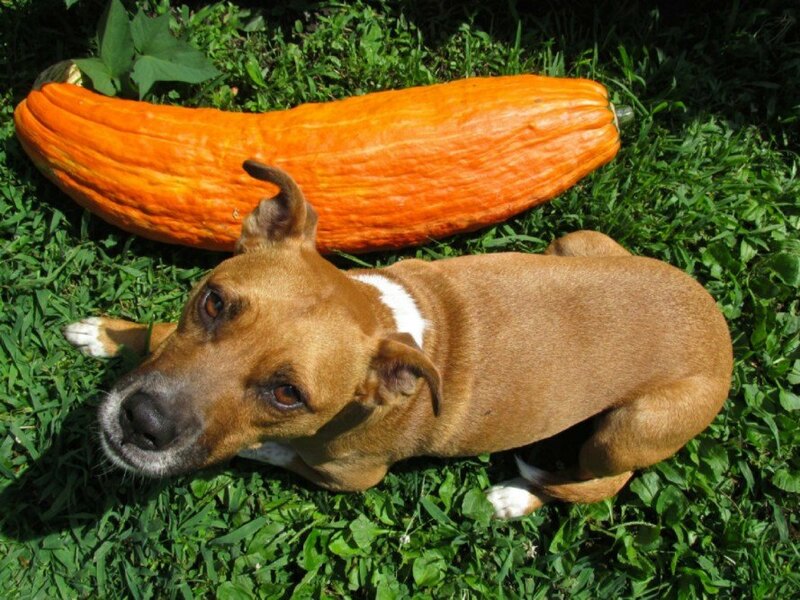 A squash next to a dog for size comparison.